Superior Sheds, Inc. is a leader in designing, assembling, and delivering portable storage buildings. Superior Sheds is a consumer-oriented company with emphasis on quality and service. We take pride in the fact that many of our new customers are neighbors or friends of satisfied customers. Everyone at Superior Sheds including our Production Team, Delivery Teams, Sales Associates, and Office/Support Staff works hard to make Superior Sheds your BEST choice for your storage needs. Every Superior Sheds building combines modern aesthetics with true utility, without compromise. Craftsmanship is assured by our Quality Control Manager, who inspects every shed, ensuring that each one exceeds State Regulations. Our sheds are Miami-Dade County Approved. All of our sheds are rated at 180MPH wind load. Manufactured in Florida for Florida weather. Complete our Dealer Inquiry Form to help us learn more about you and your business. After your submission we’ll contact you to discuss your needs in more detail. 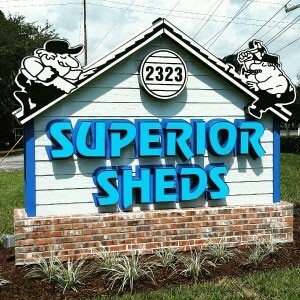 Superior Sheds builds our sheds around your tastes and style! You’ll find exciting options to match your home’s color and style. Quality, Strength and Variety = Superior Sheds! Are you looking for a great company built on ethics & integrity? Are you a hard working dedicated person with ethics and integrity? Then we are looking for you! Why Work at Superior Sheds? We would love to hear from you, so please take a moment to stop in to our Orange City location or click here to send your resume. We have locations across the state of Florida so please let us know what position(s) you are interested in and what cities or towns you are able to work in.